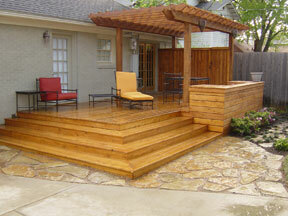 EcoSystems of Texas LLC has been maintaining and renovating DFW residential and commercial properties since 1998. We are a smaller company focused on giving each of our client’s properties personal attention to detail and quick response. Through a dedication to customer service and integrity of workmanship, the company plans to become one of DFW’s top custom landscape management and development companies. With our experienced employees and over 18 years in the landscaping business, the management is knowledgeable and well trained. By taking an ecological approach we creatively solve the outdoor landscaping challenges and needs of our clients. Provide the vision for turning our client’s ideas into clear and beautiful reality. Establish long term relationships with our clients and watch their gardens grow to both of our expectations year after year. Provide a courteous and flexible attitude of service in all matters. We are dedicated to giving our customers the landscapes they desire, we focus on understanding the individual needs of our customers and how their landscapes fit in with their objectives. We target your needs to ensure that all landscape goals are met, ensuring not only healthy plant growth but the growth and longevity of our business relationship. Please contact us today to discuss your landscape design or lawn maintenance needs and take advantage of our no-obligation "free estimate". Our areas of service include Dallas, Ft. Worth, Richardson, Addison, Los Colinas, Frisco and McKinney. Services for larger properties or projects considered out of these areas.